Automate School attendance & send instant notifications (individual or class level) to parents. School Smart is a progressive school - parent communication mobile app that helps school effectively share one-way announcements, real-time student attendance, GPS bus tracking, homework, fee schedule, exam results, time table, school calendar and much more, with just 1 click! Just think of the savings in terms of time, effort & material resources. School Smart, the revolutionary mobile communication app enables private, real time & consistent communication, which keeps parents actively engaged with their child’s school performance and impressed, giving your school that true “Smart School” edge. School Smart reaches parents quickly & privately where they are today…. and it isn’t on email! Save time with automated Student & Teacher Attendance. Instantly communicate with parents at a Group or Individual level. Real-time bus tracking through GPS. No waiting & no calls to the driver or school. Share student fee dues, paid / unpaid status & reminders easily with parents. Parents can apply for student leave instantly. No more paper applications. Share the annual event calendar with parents & sync individual calendars. Engage parents directly with student homework & improve completion rate. Directly share exam date sheet & individual student results. 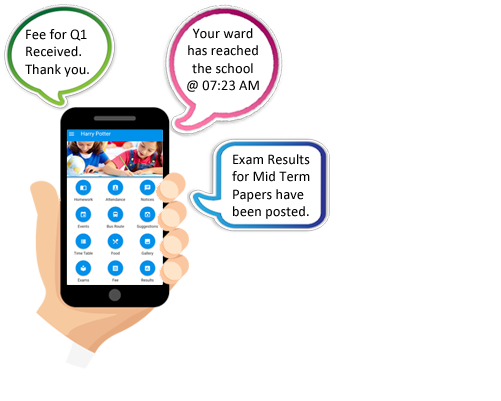 1 Click to easily share Time Table & updates with Parents. Empowers Schools to update parents easily. Always. Enterprise grade secure servers, 2FA & 100% data privacy. Same Day - On Site / Remote / Phone Support. Export Data in popular formats for customized analysis. Intuitive Interface, a few clicks get the job done. Brand the App with your School name & logo. No fixed server and related IT infrastructure costs. Hassle-Free integration with legacy systems & data. School Smart is a private, effective, comprehensive and super easy to use communication platform, connecting Schools with Parents for real-time, consistent & private communication. School Smart vs Chat & Social Media groups? Chat & Social Media groups don’t have any privacy, security nor any control on the communication flow. This is where we are so different. School Smart is a one-way communication platform that helps the school get rid of all the paper clutter and use technology effectively to communicate with parents. How does it help the school? School Smart helps progressive schools utilize valuable teacher & admin staff time efficiently and save on annual costs of paper, printing and related manpower. This technology-leverage makes the future-responsible institution easily Go Green and massively reduce carbon footprint. Using School Smart, parents can easily engage with the child’s school performance, utilize parent-child time better and always stay abreast of latest updates from the school. Historical reports are available easily on-demand along with the ability to apply for a leave through the app itself. It is reassuring for parents, when they instantly receive a notification that their child has reached / left the school premises & can track the child’s bus real-time, all through a single awesome app. A recent study conducted by Harvard University shows that parent engagement leads to 42% more homework completion, resulting in increased class participation & better grades. Apart from this, students are no longer responsible to track & share paper based notices, time table, exam date sheets, messages, homework diaries etc. School Smart has got it all covered! What can be shared through School Smart? Daily attendance status, real-time GPS bus tracking, announcements, individual notice, homework, time table, fee status, exam date sheet, results, annual calendar, food menu and so much more. Loads of features are currently under development and with each new release you’ll get them ALL @ NO EXTRA COST!! Which institutions can use School Smart? All institutions of any size like Preschools, K-12 schools, Colleges and Coaching / Tuition centers should use School Smart to save time, effort and resources and further increase their brand value. © 2017, School Smart. All Rights Reserved.